Donald Trump is a really tough guy. He's so tough that he'd build a "beautiful" 3000 mile wall and make Mexico pay for it. He's so tough that he'd magically make ISIS disappear. He's so tough that he'd call up the CEO of Ford and by the end of the day Ford would move its Mexican auto plant back to the US. He's so tough that he would start a trade war with China and within days China would stop manipulating its currency. He's so tough that he'd make Japan and Korea build their own nuclear arsenals. He's so tough that he'd make 11 million undocumented workers magically disappear. He's so tough that he chickened out of debating a 74-year old socialist from Vermont. That's right. Tough guy Donald is so tough that after appearing on the Jimmy Kimmel show and challenging Bernie Sanders to debate, he chickened out when Bernie replied "Game On". Trump is a classic schoolyard bully. He insults and threatens the other kids on the schoolyard. But when one of them actually stands up to him, he runs away and hides. Trump likes to give his opponents nicknames. 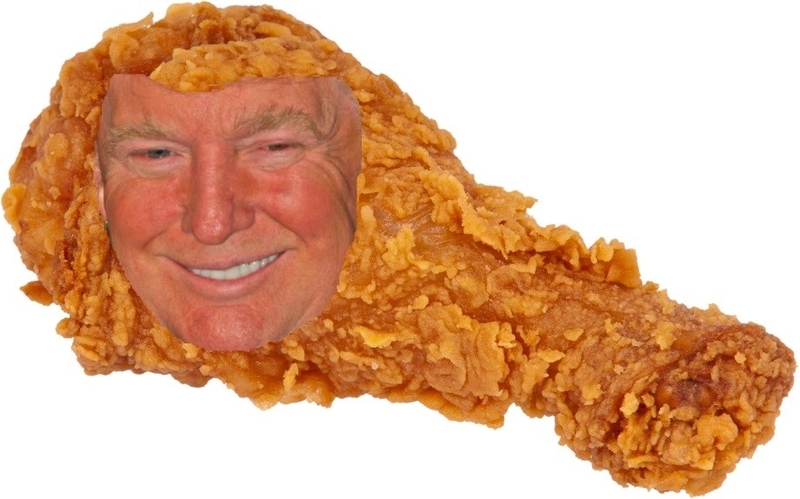 So here's Trump's new own new nickname: CHICKEN TRUMP. 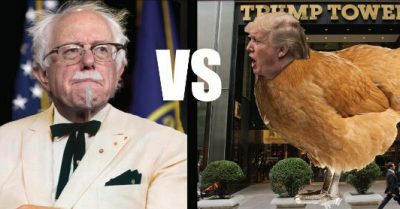 ON THE MENU: COLONEL SANDERS VERMONT FRIED CHICKEN TRUMP.